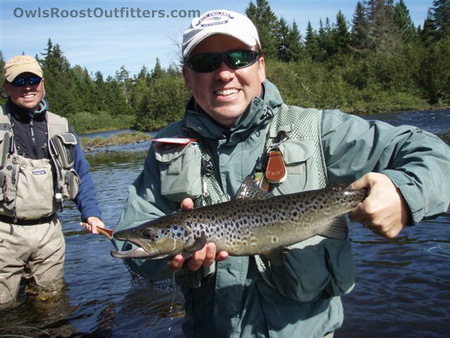 The unique fishing experience that is offered at Bosebuck Mountain Camps is unparalleled in New England. The waters adjoining this historic sporting camp are legendary and truly wild. Aziscohos Lake is considered to be a wild fishery by the Maine Inland Fisheries and Wildlife Department. So is all the water that lies up stream of the lake. The lake was last stocked with eastern brook trout in 1973 and the last stocking of landlock salmon here was in 1999. The Upper and Middle Magalloway are not stocked nor have they been by the State of Maine because they are behind locked gates. All these factors create one of the few real wild fisheries left in the United States for eastern brook trout and landlock salmon, in one of the last wilderness areas in the East. Come and join us on a fishing adventure few have the opportunity to experience. It is a place where the every day interactions of nature unfold themselves to you around each bend in the river. Don’t be fooled, the fish in the Magalloway River System are wary competitors. A two and half pound brook trout doesn’t get to be that large by making mistakes. These fish hatched from eggs here and have learned their lessons well. Because this is a wild fishery that is dependant upon natural reproduction the small ponds and both the Big and Little Magalloway rivers are fly fishing only. This is only one of the management strategies that have made this water arguably one of the best wild trout fisheries in Maine, if not all of New England. Bosebuck Mountain Camps believes in the catch and release methodology and promotes its practice. But if trout or salmon is what you crave, our cook can prepare any legally taken fish that you bring back to camp.